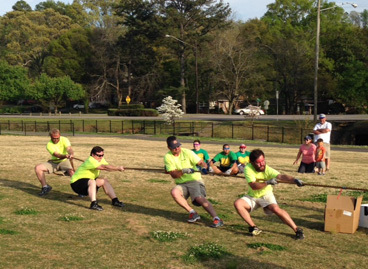 The Gateway Foundation of Birmingham recently hosted its third annual Faux-lympics where sixteen teams, as well as family and friends, met at Crestwood Park in Birmingham for an afternoon of food, fun, and friendly competition. The teams fought for the glory of a first place trophy, while competing in events such as three-legged race, pizza-box relay race, and tug of war. The Faux-lympics is an annual fundraiser for Birmingham’s Gateway Foundation. This non-profit organization has been providing family counseling, foster care, financial advice, and transitional living assistance to local families for 123 years. Started in 1891 as a home for unmarried mothers and a temporary home for troubled youth, Gateway has become an organization dedicated to “transforming the lives of families in crisis and delivering hope to the hurting” as they fill an important niche in the Birmingham metropolitan area. 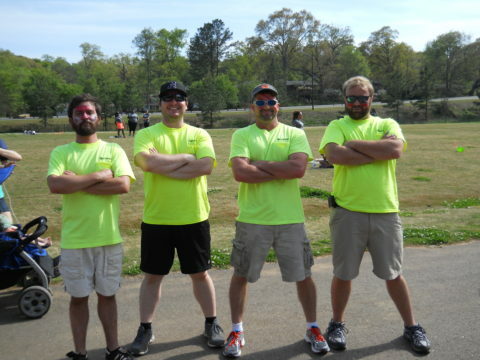 Michael Imhof, Kyle Haggard, Eric Reardon, and Daniel Gossett of the Birmingham office showed up with game faces on. Literally. With fluorescent yellow Terracon t-shirts and maroon war-painted faces, the guys meant business while also maintaining proper Terracon branding. When the last event was over and the dust had settled, it was Terracon that came away with the win. With a hefty point total of 1,485, 105 more than the second place team, Terracon easily took first place. Most importantly, the event helped to raise more than $16,000 for Gateway Birmingham. “Although the sweet taste of victory was very fulfilling, knowing that funds had been raised for neglected children and deserving, local families in need was the highlight of the day,” said Gossett.